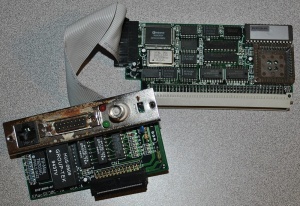 Ethernet card for the Macintosh SE/30 via PDS expansion. We're unsure of who actually manufactured this card but it seems to work with generic Apple drivers both within System 7.5 and Apple UNIX. This card is also confirmed to work in the Macintosh IIsi under System 7.1 using the stock Apple Ethernet drivers and Open Transport 1.1.1. This is likely why the card comes with an FPU socket as the SE/30 already features an FPU. This page was last modified on 28 February 2019, at 01:34.